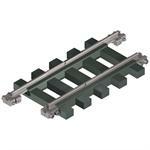 Design the perfect model railroad or garden railroad layout with Split Jaw Products! The clamps works will all Code 332 with a flange width of 7.0mm to 7.5mm. 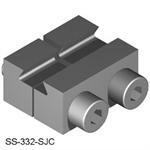 SJ Plastic/SS Code 250 Insulating Joiner 6.0mm - 4 Pk. Grips the rail much better than an all plastic clamp. Bonus Feature-To power a siding, simply connect a jumper wire between the two screws. 1 pair of Split Jaw brass wheel stops. Split Jaw Brass rail clamp, code 250, specifically for the Llagas Creek track. Code 250 Double Brass Clamp-5.0mm 2/Pkg. 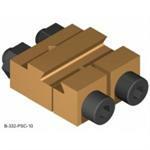 Over the Joint Power Connector-4 Pk. We offer a large selection of tools and connectors to keep your garden railroad in top shape, including the Aristo Stainless Steel (European) 1" Track Style Expanding Rail Bed, from Split Jaw Products. 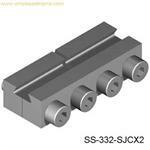 We offer a large selection of tools and connectors to keep your garden railroad in top shape, including the Wire Connector SLU 25, from Split Jaw Products. Aristo Brass Bridge Entry 12"
We offer a large selection of tools and connectors to keep your garden railroad in top shape, including the Aristo Brass Bridge Entry 12", from Split Jaw Products. Aristo Brass Bridge Section 12"
We offer a large selection of tools and connectors to keep your garden railroad in top shape, including the Aristo Brass Bridge Section 12", from Split Jaw Products. LGB Brass Bridge Section 12"
We offer a large selection of tools and connectors to keep your garden railroad in top shape, including the LGB Brass Bridge Section 12", from Split Jaw Products. We offer a large selection of tools and connectors to keep your garden railroad in top shape, including the Brass Over the Joiner Split Jaw Clamp, from Split Jaw Products. Heavy duty for #12 wire. We offer a large selection of tools and connectors to keep your garden railroad in top shape, including the Brass Power Connector, from Split Jaw Products. We offer a large selection of tools and connectors to keep your garden railroad in top shape, including the Brass Standard Split Jaw Rail Clamp, from Split Jaw Products. We offer a large selection of tools and connectors to keep your garden railroad in top shape, including the Brass Standard Double Split Jaw Rail Clamp, from Split Jaw Products. We offer a large selection of tools and connectors to keep your garden railroad in top shape, including the 7/64 - 4 1/4" Ball Hex Driver Blade, from Split Jaw Products.